Preheat oven to 220° C / 430° F.
Mix couscous and hot vegetable stock in a bowl. Leave to soak while preparing the remaining ingredients. Wash and peel your vegetables, then grate finely. Mix couscous, veggies, herbs and yogurt. Season with salt and pepper, then whisk the eggs and add to the mixture. Spray your muffin pan with oil or line with paper cups, then pour the mixture into the cups. Bake at 220° C / 430° F for about 30 minutes. Cube the watermelon into rectangles, then slice each across the middle horizontally. Cut the feta into ¼ inch planks. Cut into pieces the same width as the watermelon. 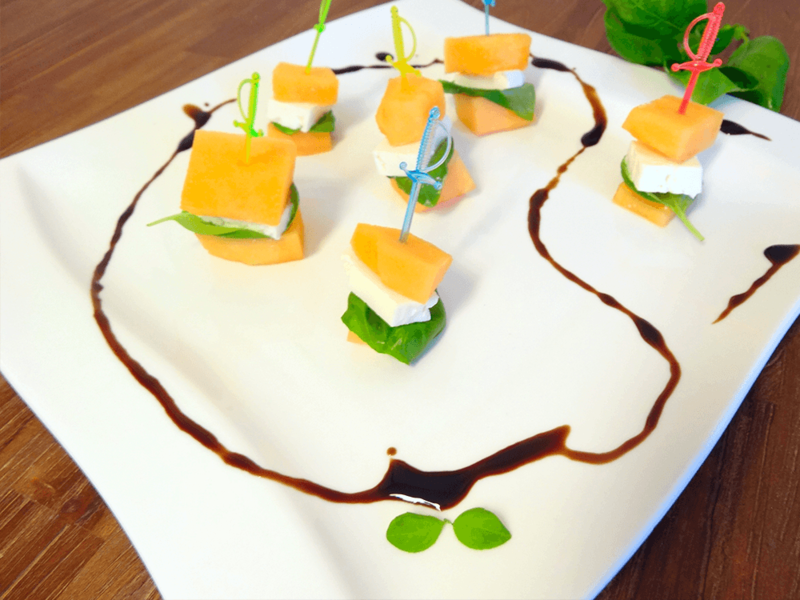 Put a basil leaf on bottom slice of watermelon, top with feta then sandwich between another slice of watermelon. Insert pick. Before serving drizzle with balsamic vinegar. Halve the cucumbers length-wise and scrape out the seeds with a spoon. Mix cheese, herbs, salt and pepper then fill in the carved out cucumbers. Cut into 2-inch pieces. Spread a generous amount of cream cheese on one side of your tortillas. Top with lettuce leaves and smoked salmon then roll them up and fix with a toothpick or two. Put in a cool place for a few minutes then cut at an angle into small rolls. Fresh dill is ideal both to garnish and for some extra flavor. Have fun cooking & a happy New Year!